Just a little post to share pictures of my beautiful new cardigan. It arrived yesterday, in the loveliest package I have ever received, with a sweet little note from the equally sweet and lovely Marcine. 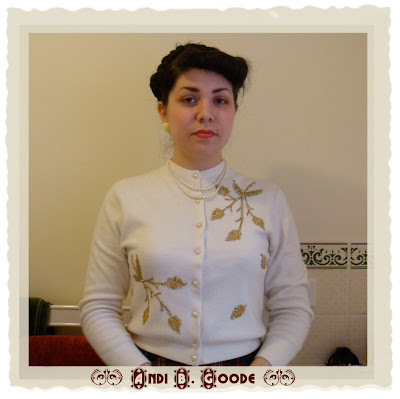 It's the only vintage cardigan I own - the cut is so much nicer than any other cardigan I have, too! I don't think this is the ideal skirt to wear with the cardigan but I was keen on wearing it as soon as possible, after it arrived yesterday. I've also started uploading some old pictures of myself because, well, why not? 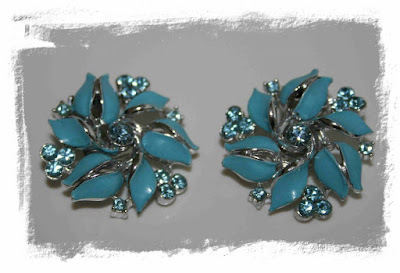 One last thing, The Glamorous Housewife is hosting a giveaway in celebration of her 100th post (and 50th follower) and she's giving away these darling turquoise earrings. Head on over to her wonderful blog to enter yourself! 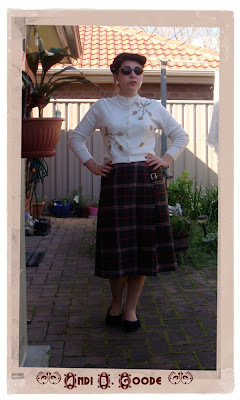 I'm such a big fan of Vintage cardigans! When you find the right one, you don't ant to take it off (or I know I don't !) You look lovely! Thats a great cardie! :-D I'm on the hunt for one myself and they are surprisingly thin on the ground right now. Where can you get good ones? I tried Portmans with no luck. What a find! That is an excellent vintage sweater. And thanks for posting about the earring giveaway. What a lovely cardigan! I have TONS of vintage ones, I like them so much better than new ones. They are always made better and it's very hard to find new cardis that are beaded or embroidered. Wow, that sweater is gorgeous! It really does have a beautiful fit compared to today's cardigans. I thought I had seen that cardigan before! Now I remember seeing it on Marcine's etsy. It's so pretty! beautiful cardigan! Just lovely on you! What an incredibly beautiful cardigan! You look a million dollars in it, sweetie! Congrats on your wonderful new wardrobe treasure. Esz: Thanks. =] Well, this one's vintage, as I mentioned, but I've not really kept my eye open at any other shops, lately. I should start doing that! Ms. B: Thanks. 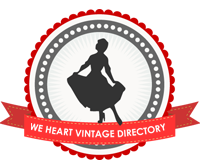 =] I'm definitely going to have to hunt down more vintage cardigans and sweaters, now! Amanda: Thanks. =] Yes, it's so lovely! Miss Dee: Marcine always has such lovely things in her shop! Alex in Wonderland: Thank-you! =D I was really lucky to find this one.